Family Business leaders often need to initiate team building activities to help family business team members increase their self-awareness. Team members who have a strong self-image focus better, are absent from the job less often and are better able to get along with their coworkers. Compare this to those with low self-awareness who make more mistakes, are slower and may even hesitate to give 100% to their responsibilities. It is crucial you devise tactics to boost the morale level of each worker in your family business – both family members and other employees. Some tools that work well to build self-worth are group activities, motivational tools and individual learning exercises. Start by demonstrating your trust in each team members’ abilities. If you micromanage, it is perceived that you don’t trust the team member to do their job. This may translate into poor self-image. It will be more productive to provide adequate training in their job role and trust them to do the job without looking over their shoulder. ‘Give credit to whom credit is due.’ This phrase is usually credited to Samuel Adams and dates back to 1777. It still applies today. When your team member is giving 100% to the family business and devises a plan to meet the business goals, nothing will deflate them quicker than having someone steal their idea. Especially if the “thief” is the family business manager! Always be sure to credit the rightful creator of an idea or new technique when you implement it or bring it to discussion in your business planning. There are times when you need to hire outside help, such as a professional coach, to help team members build their self-esteem. The Family Business Performance Center offers workshops and peer groups as well as individual and group coaching. A trained coach will know how to motivate all individuals in your family business. You can also use personality assessment surveys to increase each team member’s self-awareness. There are many available on line. I recommend and use The Right Path Profile. It might be helpful for team members to keep written daily journals. They can have an outlet for feelings and thoughts. Having this written record of their thoughts and emotions will help them become more aware of how specific situations affect them and the family business. Take extra care to seek out quieter members of your family business. If they are introverts they may not freely express their opinions. In addition, you may have a particularly gregarious family member who the meeker family member always yields to in a conversation or decision-making situation. As the family business manager, you should seek these members out and encourage them to contribute. This will increase their self-awareness and ultimately enable them to freely share in family business decisions. As the family business manager, you should schedule time to review issues with all team members both in private and with the entire team. Each team member needs to be able to express their feelings and address how negative feelings can be resolved. Occasionally get your team members “out of their box.” You do this by encouraging them to explore unfamiliar roles or duties. When they come out of their comfort zone, they will experience tremendous growth and positive self- awareness. Examples of this could be the bookkeeper traveling with the salesman for a day. Other tactics you are probably familiar with, are rope courses. 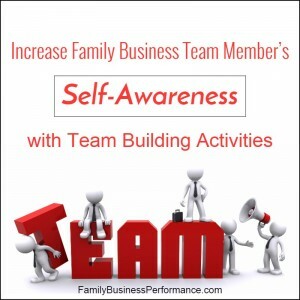 Your family team members will set better goals for themselves if they have high levels of self-awareness. They will be more attuned to their goals, how to accomplish them, and it may help them communicate better with other team members, clients and the family business leaders.